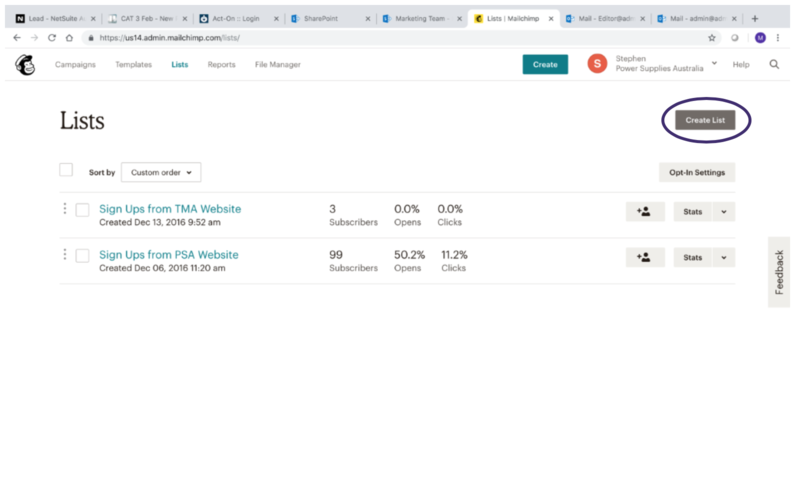 Marketing automation platforms are extremely useful tools for a small business, as they allow you to set up automated responses for each time someone completes a form on your website. Some marketing automation platforms can also be integrated with CRM / ERP systems to give the business owner complete visibility of the sales process, showing the transaction right from the start at the time the customer first landed on your website, recording the content and information the customer downloaded, managing quotes to the customer, right through to the delivery of goods, or services. For many small businesses it is not financially viable to invest in a fully integrated Marketing Automation / CRM / ERP system. The good news is that there are some free to use software platforms that give you some level of automation. Some of our readers will be familiar with the term ‘gated content’. This is where a visitor to your site is required to fill in a form to access a document, or other type of content. This can be managed on the website itself. But the most you can do is capture some information about the visitor. You need to manually download the information and then do something with it. Using marketing automation, you can automatically send a follow-up message to the visitor. You may want to thank the customer for downloading the information and ask them to call you if they have any further questions. This is just one example; a follow up message can be anything. It is a good idea to make it a logical next step in the buying process. For example, if you were running gym classes and the visitor to your site has just downloaded a document outlining the benefits of a particular class, you may want to send the customer a message inviting them to one free session, so that they can try it out before committing to buying a membership, or multi-visit pass. 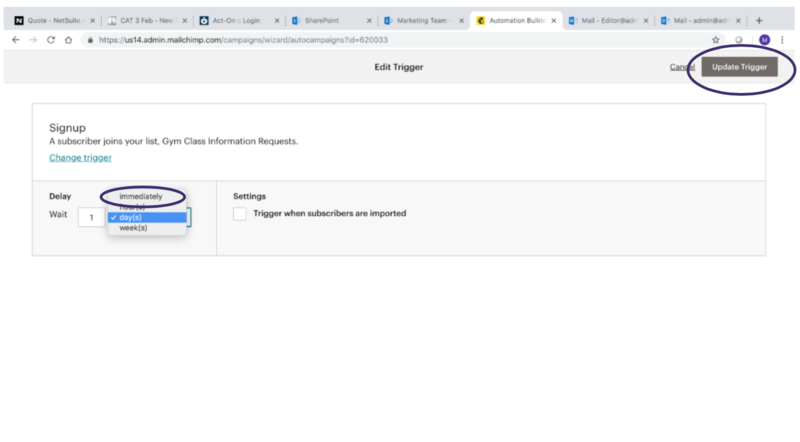 This is a basic level of automation and can be done in a free platform such as MailChimp. 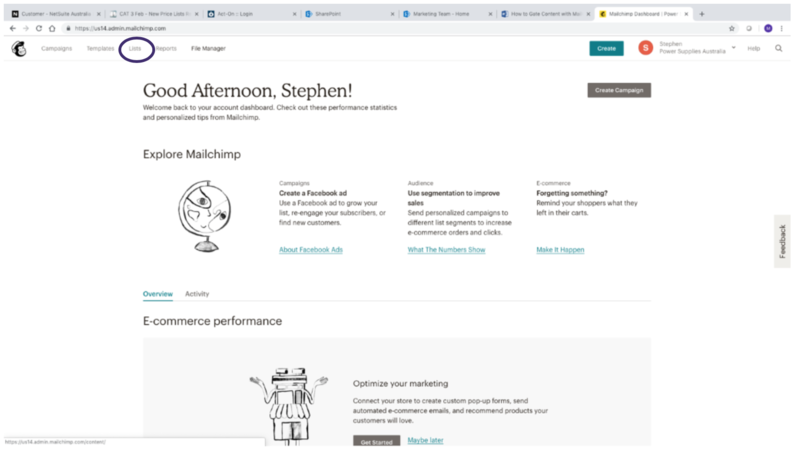 In this article, we will show you how to set up such an automation in Mail Chimp. 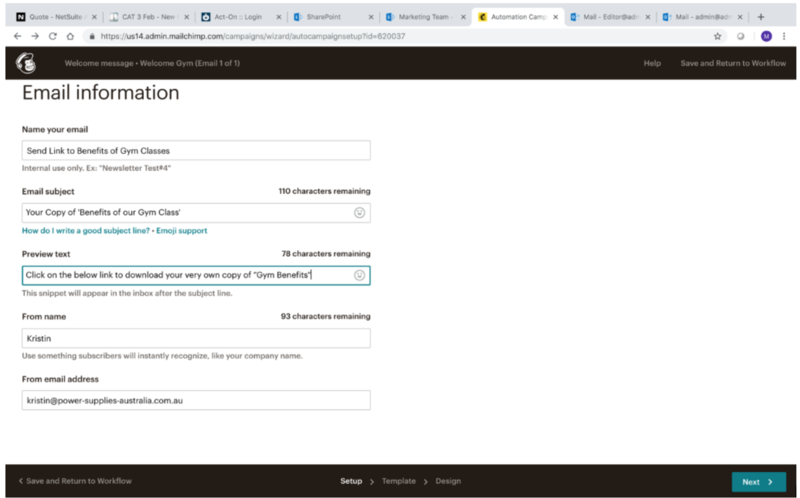 MailChimp gates content by sending it as an email attachment that is sent after the webform is completed. So, you need to upload the content to MailChimp. 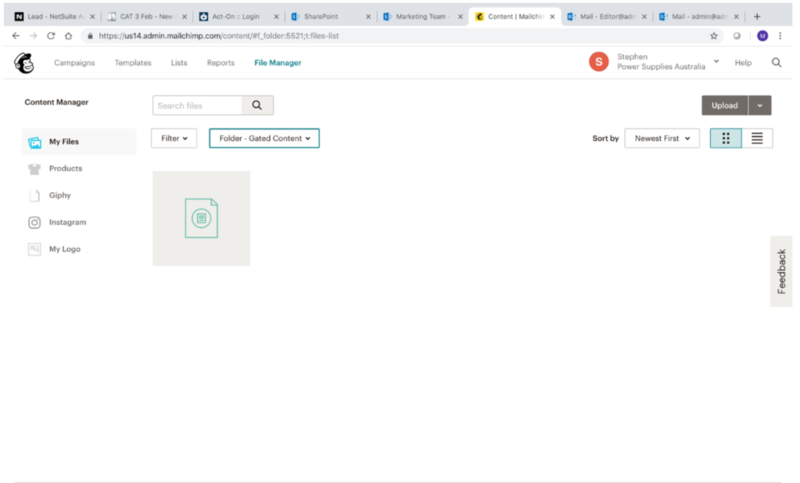 This will take you to the Content Manager, where you can upload files from your computer and sort them into files. 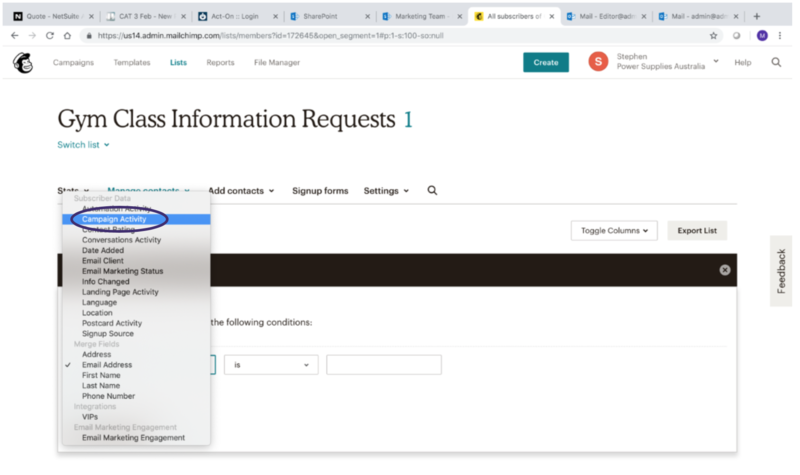 You need to have a List in MailChimp that visitors’ details can be added to. 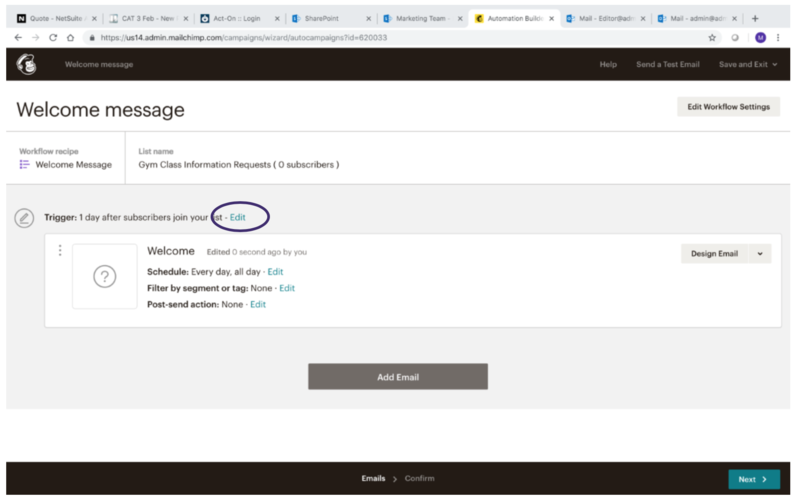 If you are already using MailChimp and have an existing List you wish to use, you can skip this step. Otherwise click on the ‘Lists’ option in the menu bar at the top of the page. On the next page you will see a Create List button. Click on this and follow the steps for creating your new list. This is a Landing Page that will invite your customers to sign up for the content that they would like to download. 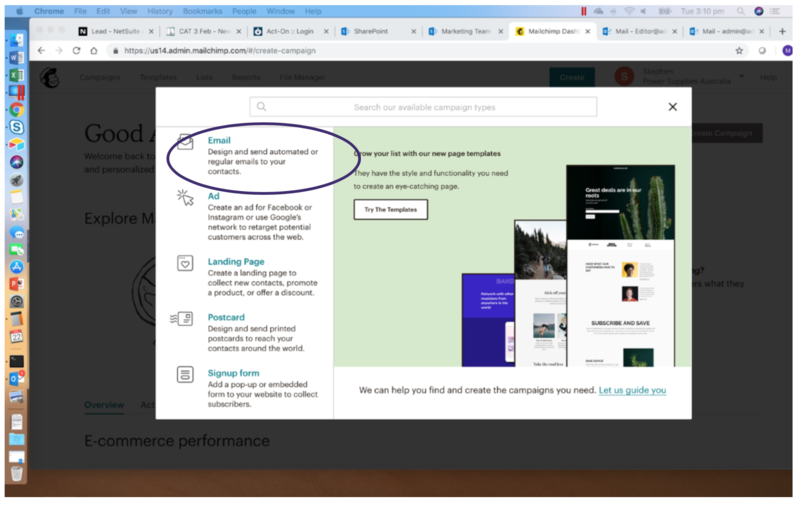 On the MailChimp home page click on the Create button. 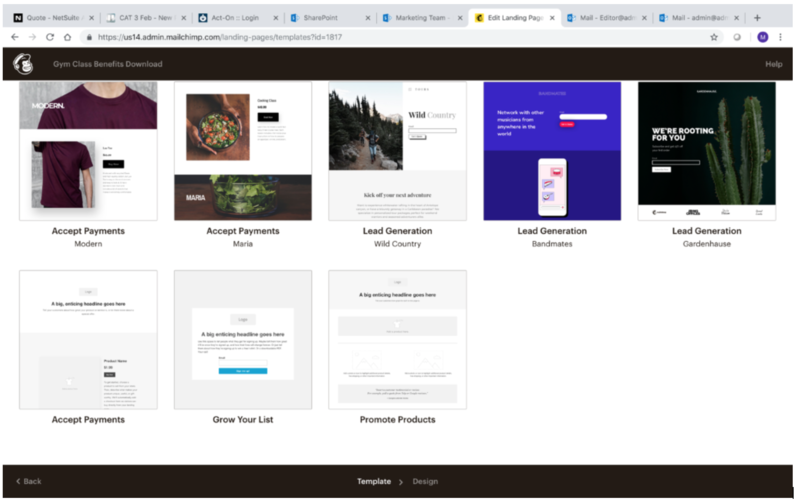 Once you have given your landing page a name and selected the list it is to add contacts to, you can select from a pre-existing template for your landing page, or you can create your own. 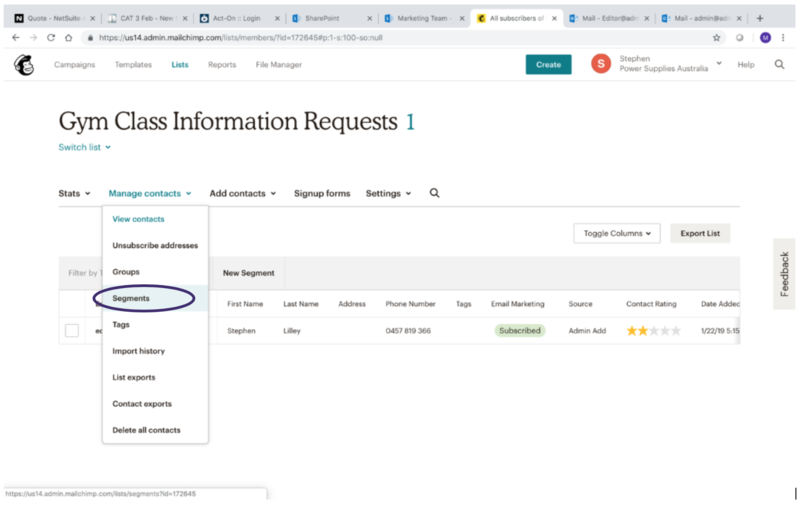 You can choose the fields that you would like your customer to complete, before they can access the document. Once you have your landing page looking just as you want it, click on ‘Save and Close’ at the bottom right of the page. 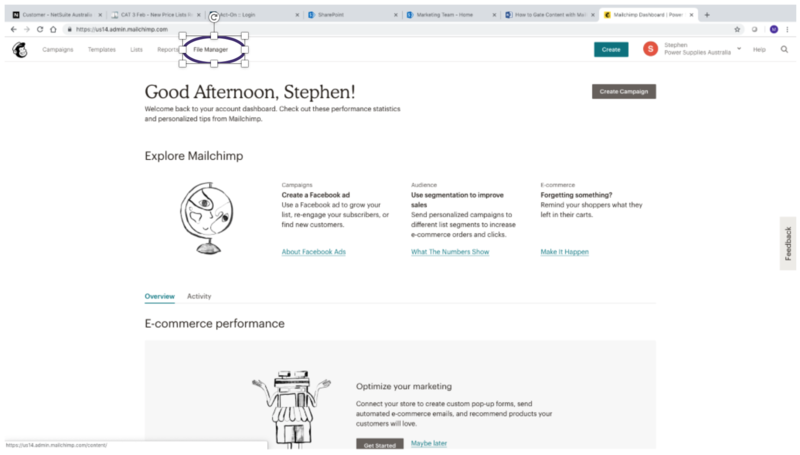 On the next page you can give the landing page a working title that will be used within MailChimp. 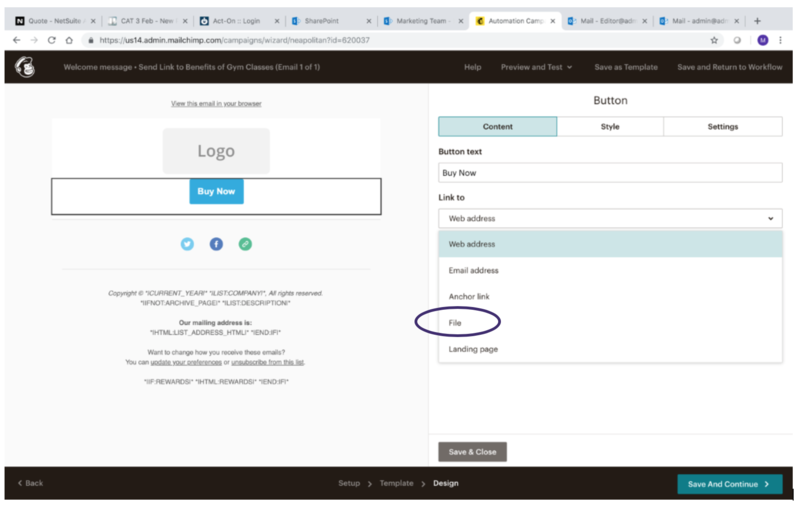 Click on the Add URL button to create a URL, which you can use on your website to direct customers to the sign-up page. 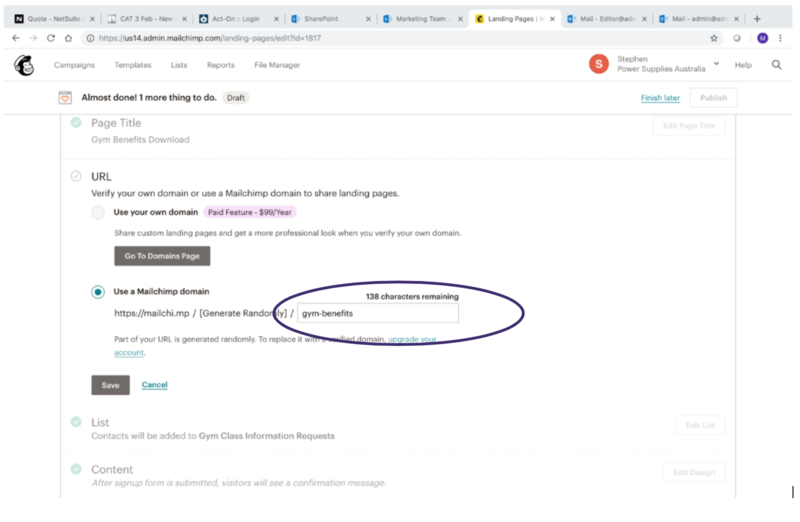 Unless you want to use the paid feature, you will need to use the MailChimp domain option. You are given the option of naming the last part of the URL. Once you have completed these details you can click the Publish button. This time you want the Email option. On the next page, select the ‘Automated’ option. Then select welcome new subscribers. 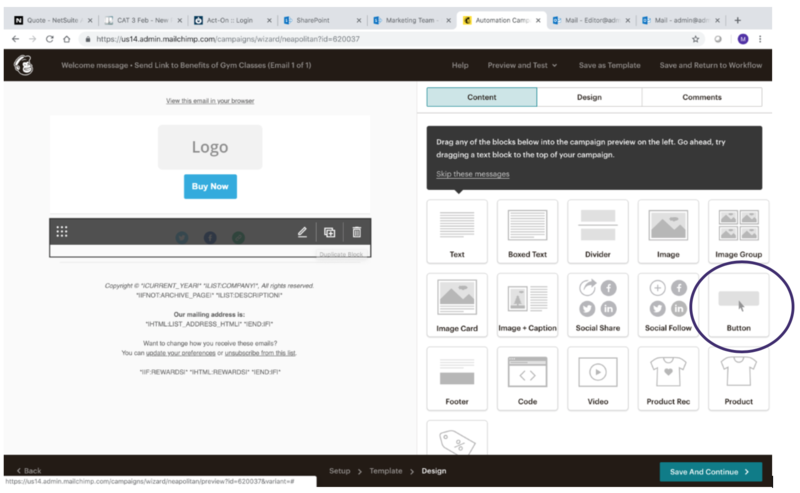 On the next page give your Campaign a working title, so that you will easily recognise it in MailChimp and select the list it will be working with. On the next page you will see a section called Trigger 1. 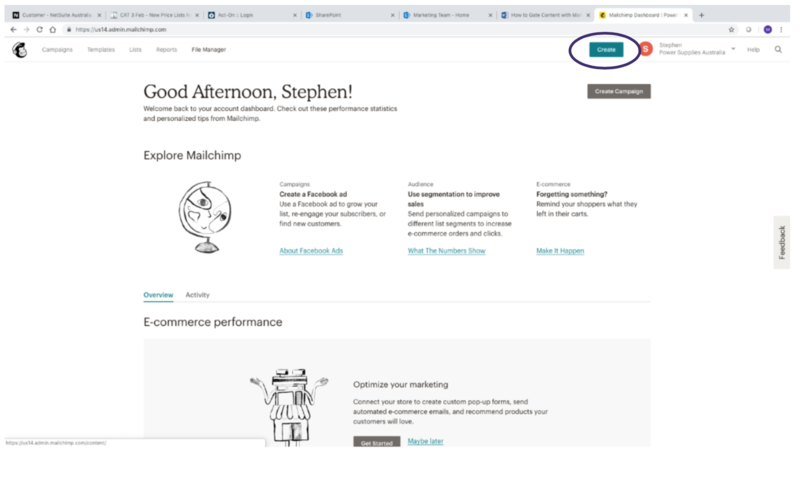 Here you can set the wait time before MailChimp sends the message after a visitor has added their contact details to your list. You will see this is set to 1 day after subscribers join your list. As the visitor is waiting for your content you will want to change this. Click the ‘Edit’ button adjacent to the wait time. On the next page you can edit the wait time. In the drop-down box there is an ‘Immediately’ option. Select this and then click on ‘Update Trigger’. You will now find yourself back at the message set up page. 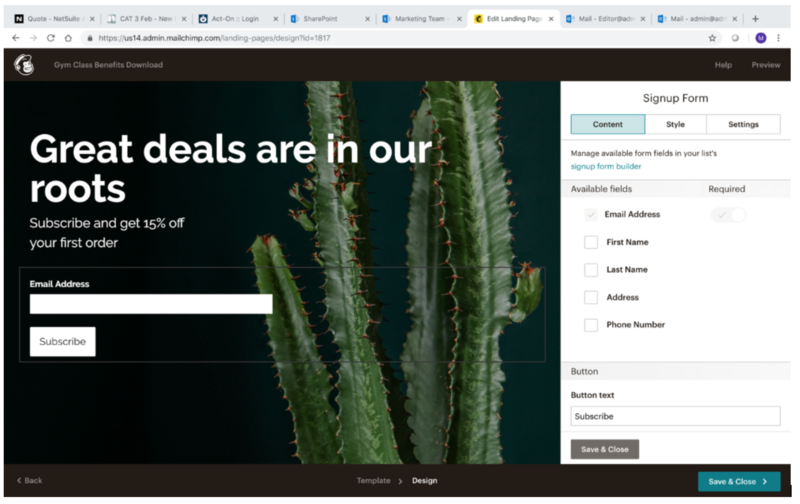 Click on Design Email to create the message your customers will receive with the link to the document. First, you will need to give your message a working title. Then create an Email subject that clearly tells the customer what is in this message. For example, “Your Copy of Benefits of Our Gym Class”. The preview text is where you enter the important text from within the email itself. For example, “Click on the below link to download your very own copy of “Gym Benefits”. Finally, you will need to complete the From name and From email address. Click ‘Next’ at the bottom right of the screen. On the next page you select a template that you would like to use for this message. For this exercise we are using a Basic 1 Column template. Click and drag elements into the template that you would like to see. 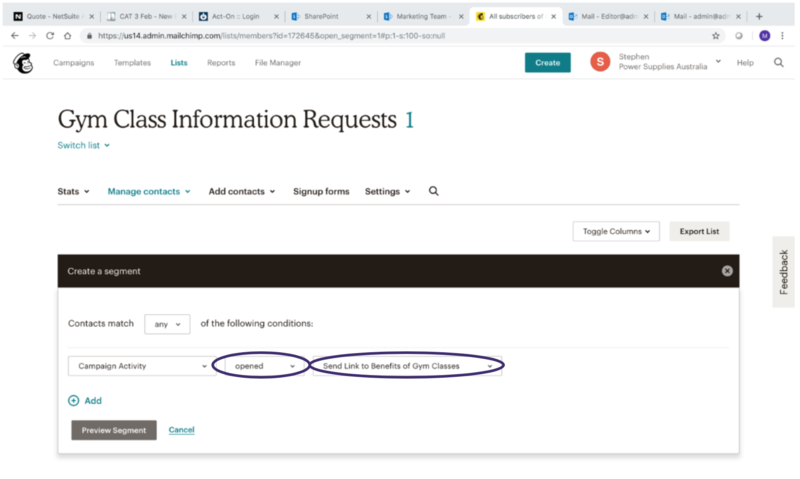 The one you must include is the button, as you will use this to provide access to the document the customer has requested. You will be taken to the ‘File Manger’ where you select the File you uploaded earlier. Once you have selected this you will be taken back to the message editor, where you can finish creating you email message. Once you are satisfied with the message click on ‘Save and Continue’ at the bottom right of the page. You will now be taken back to the Automation creation page. To finish the set up click ‘Next>’ at the bottom right of the page. On the next page click ‘Start Sending’. 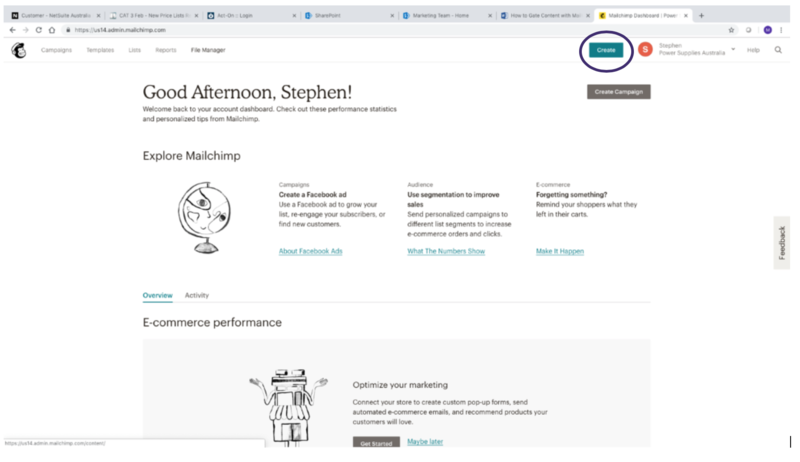 Take the MailChimp URL you created earlier and add it to your website. 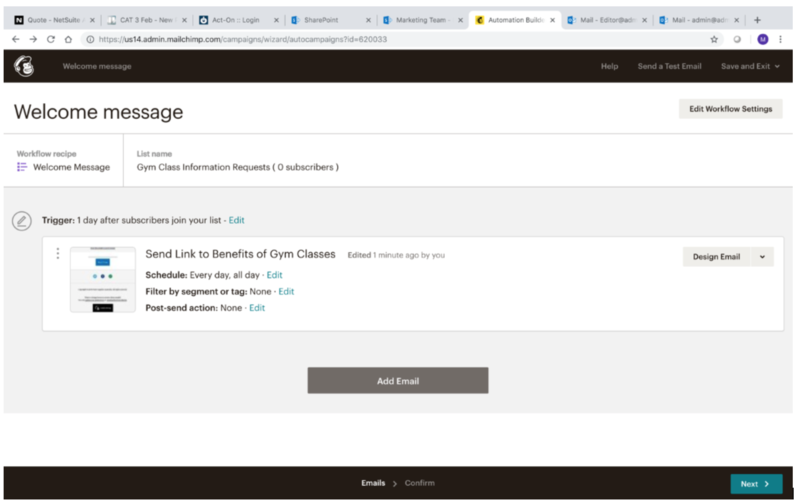 You may want to write a blog post about the advantages of going to the gym and invite the visitor to download your class information brochure by clicking on the link. Alternatively, you could have a pop-up box inviting the customer to download this information. 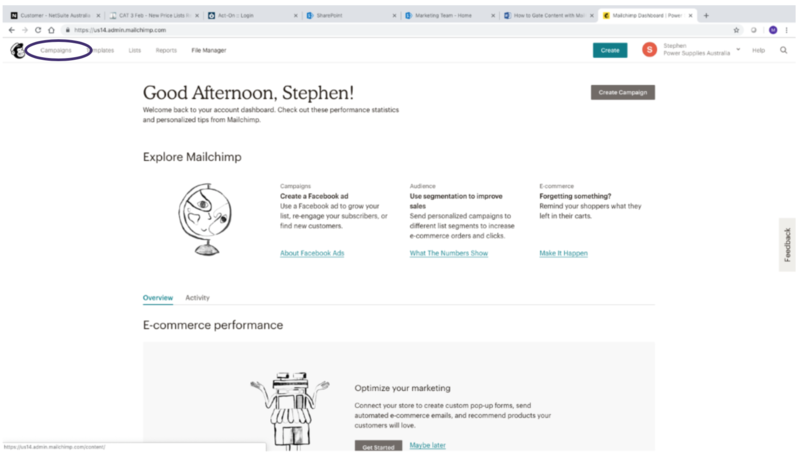 Once the customer clicks on the URL, they will be taken to the MailChimp landing page. 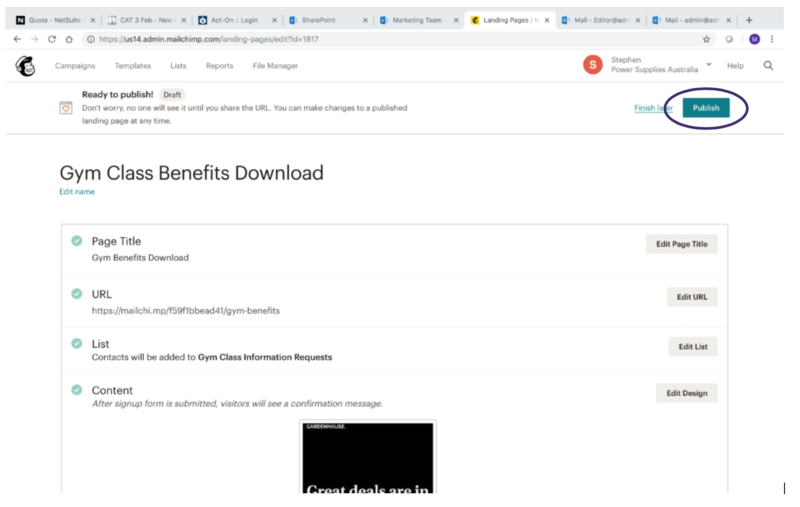 After completing their details, they will be added to the mailing list and will receive an automated message with a link to download the document they requested. If you wanted, you could add further steps to the automation. 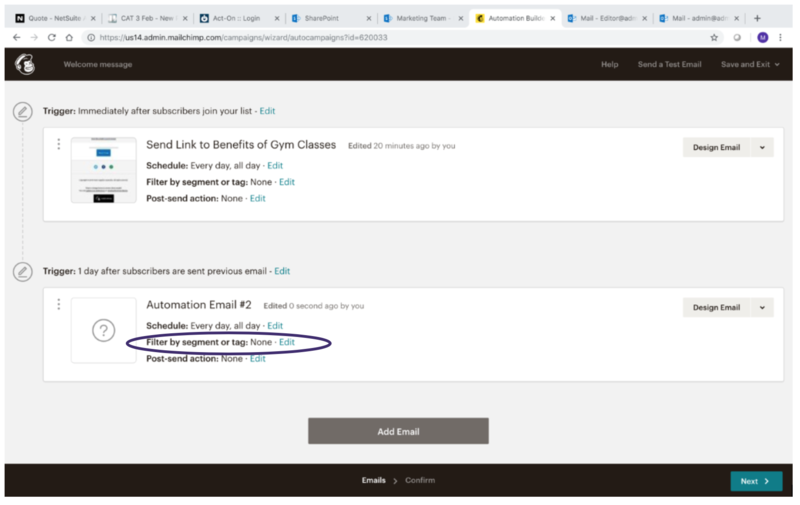 For example, you may want to send a follow up email asking the customer if they would like one free visit to the gym to try out a class to see if it is suitable for them. 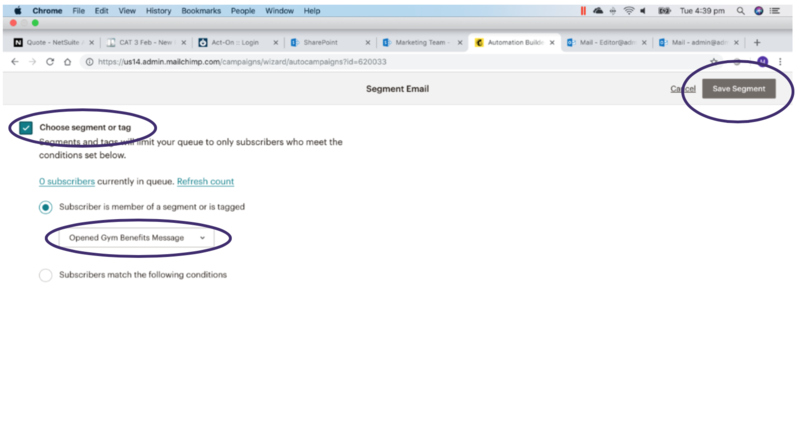 To do this the first thing you would need to do is create a Segment within your mailing list for customers who opened the above message that you just created. In the drop-down box click Segments. On the next page use the drop-down box to select the ‘Campaign Activity’ option. 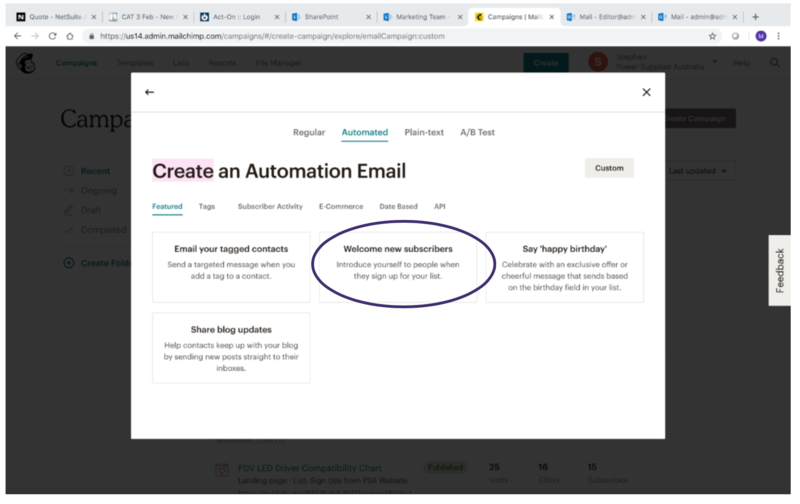 Then set the criteria to ‘opened’ and the message that you used created in the above Automation. If any contacts already meet this criterion they will now be listed. 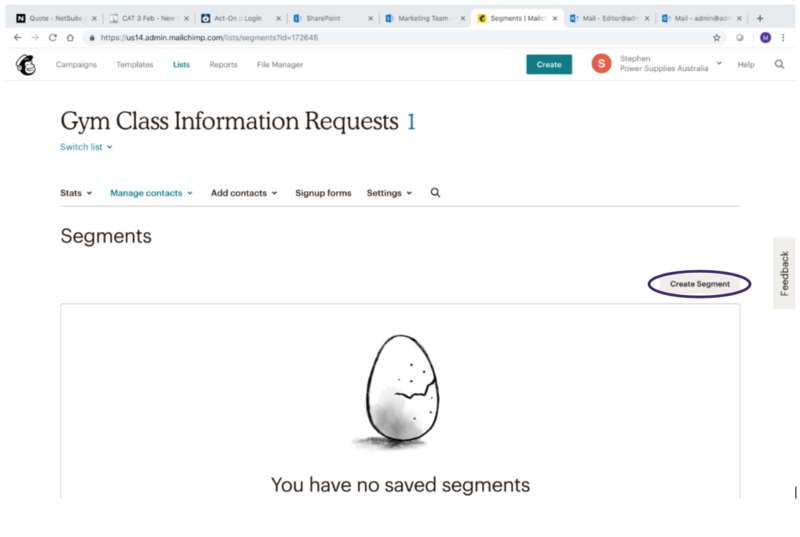 Otherwise you see a “Goose Egg” error message. Either way still click ‘Save Segment’. 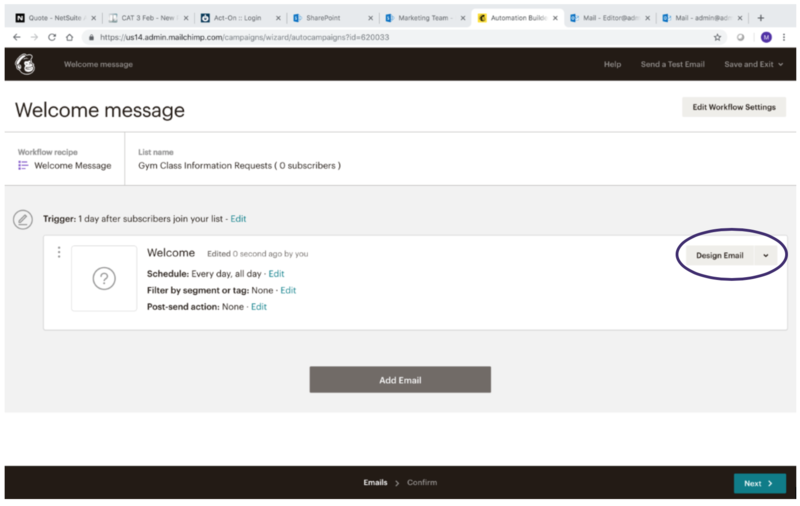 MailChimp will automatically update this segment as customers open your message. Next, navigate back to your Automated message. 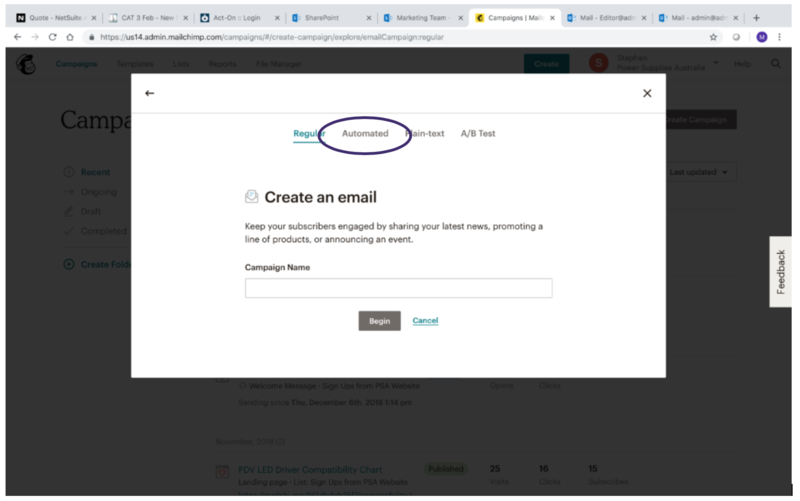 You will find it listed under the ‘Campaigns’ tab at the top of the MailChimp home page. This will add another Trigger. You may want to leave it a week before sending this message, so set the wait time accordingly. Create a second email inviting the customer to attend a free session to try the gym class, as you did above for the original message. Once this is done you will return to the Automated set up page. You will see that there is an option to filter by segment or tag. Click on the ‘Edit’ button adjacent to this option. On the next page check the ‘Choose segment or tag’ box. A drop-down box will show, where you can select the segment you created earlier. Once saved you will be taken back to the Automated message set up page, where you can review your Automated program. 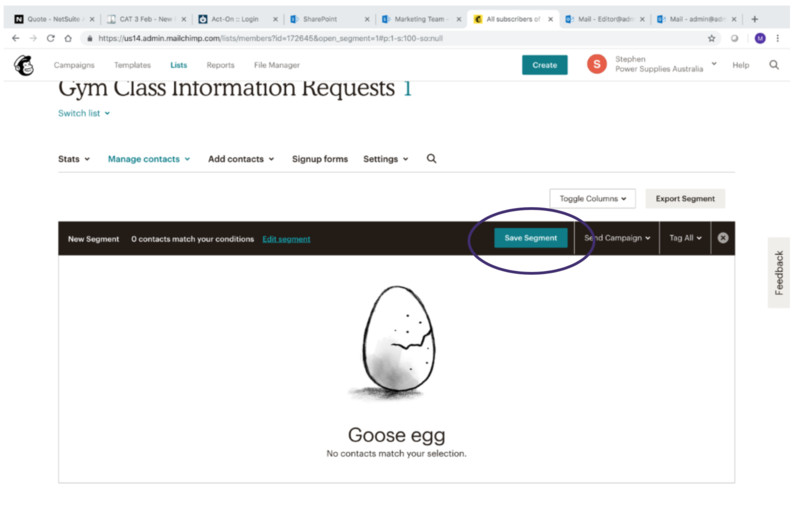 Immediately after contacts have been added to your mailing list, they receive the message with the link to download the requested content. The program will then wait 1 week. If a contact has opened the first message, they would have been added to the segment you created for this activity. The program will send contacts in this segment the invite to trial a free class. This level of automation can be very useful for small businesses. This simple program captures information about leads who are interested in your product and automatically follows them up for you. What’s more, this is a free service. 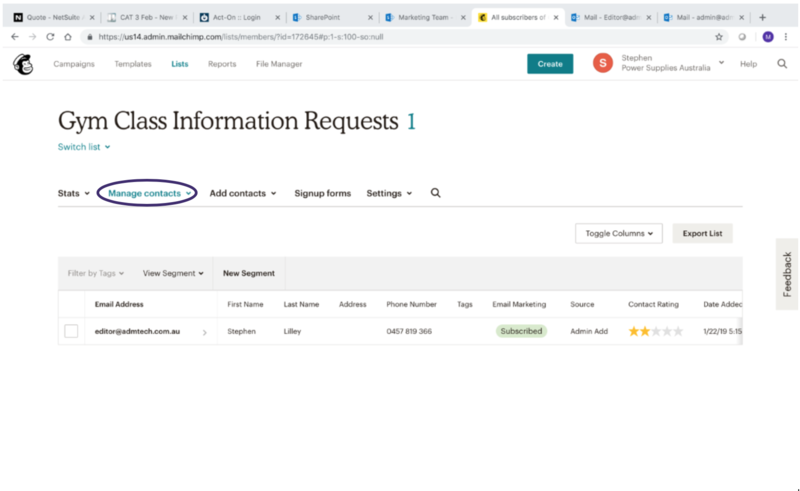 You only start paying for MailChimp once the number of contacts in your list exceeds 2000 and / or you exceed sending 12,000 emails per month. As you can see, this is fairly easy to set up yourself. There is no need to engage a marketing consultant.